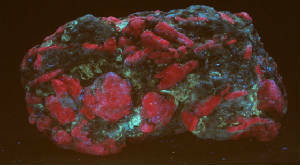 I have hundreds of fluorescent minerals available from famous locations around the world. 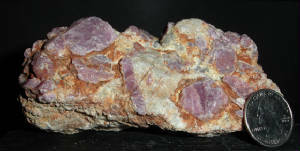 If you are looking for a particular specimen, E-mail me and I will send you a list and a photo. In addition to the single specimens shown here, I have boxed sets of beginner mineral collections of Longwave U.V. 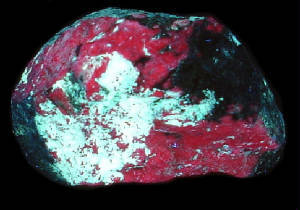 Longwave collections are perfect for the novice collector and a great way to learn about the world of fluorescent minerals. Collecting Longwave specimens is an excellent way to begin or expand your fluorescent collection. Great specimens are available for novice to advanced collectors. Longwave UV lights are inexpensive and easy to acquire. See our UV lamp page for more information. 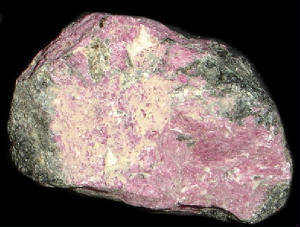 Numerous choice crystal corundum rubies on this exceptional very large cabinet size specimen. Displays well from any direction. 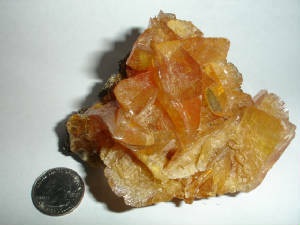 2" x 2.75" x 4.65"
This specimen has a little white fluorescent Feldspar. 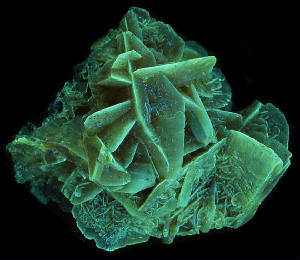 1.75" x 1.90" x 2.80"
Visually attractive golden Selenite crystal cluster is fluorescent under both long and short wave UV and is phosphorescent. 2.50" x 3" x 4"
BID NOW! EBAY auction as the "MINERALMANCOLLECTION"
Thank you for visiting, come back again soon. All pictures on this web site are the property of Darwin Warriner aka Mineralman and can not be used with out prior permission. Contact me in writing if you wish to copy or use any pictures on this web site.